Though Libby Kellerman and Hunter Simon grew up within fifteen minutes of one another, went to the same college, and attended the same law school, it was a chance meeting in a wine bar in Beverly Hills that first brought the two together. Their chemistry was immediate and the future bride and groom quickly recognized something more than simple chance must have been involved in putting the two in each other’s lives. Coming just three days after Libby and Hunter’s six-year dating anniversary, the wedding served as a testament to the amazing bond they first struck in law school. 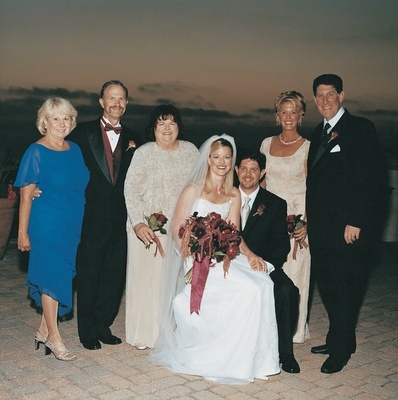 Libby and Hunter held their wedding ceremony and reception at the Four Season’s Clubhouse at Pelican Hill, which offered wedding guests a range of spectacular views of the Pelican Hill golf course, the ocean, Newport Beach and beyond. Framing these views, the Clubhouse’s Spanish Mission-inspired architecture lent the setting an elegant but fun air, and a true Southern California ambience. The uniquely touching ceremony combined elements of the bride and groom’s respective Christian and Jewish heritages, uniting many generations of family and traditions. The Rabbi gave moving comments on Libby and Hunter’s friendship and love for one another and read aloud the text of the ketubah (Jewish wedding contract) that they wrote themselves. Two of the ceremony’s most special moments came when Libby’s brother, Randy, sang “She’s Got a Way” by Billy Joel during the ceremony, and when everyone came together during the reception to celebrate the union with a joyous and spirited dancing of the hora. 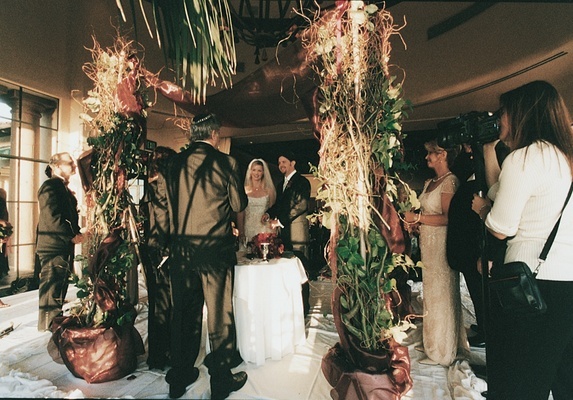 The bride and groom’s chuppah was made of four pots with natural twigs and curly willow, topped with tied burgundy fabric to create a distinctive coverlet. Designed by L’ezu Atelier, the bride’s magnificent gown was accessorized by an antique bracelet and pendant from the 1920s. Both were treasured gifts from Libby’s beloved grandmother who had passed away, and the delicate jewelry added a spirit of sentiment and history to the already emotion-filled day. 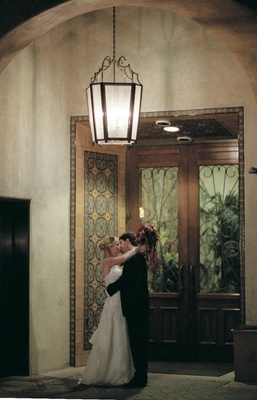 Giving off a warm, inviting glow, an abundance of candles illuminated the reception. Roses, countless in number, provided the day’s elegant floral theme. 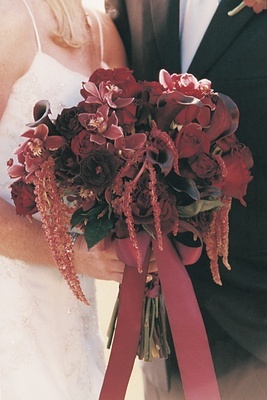 Black magic roses, black beauty roses, and Bacarra roses were joined with burgundy hanging amaranths, coffee beans, dark calla lilies, burgundy and green hydrangeas, burgundy dahlias, chocolate geraniums, and dark purple grapes to create unique, striking centerpieces. The bride and groom added green orchids to the floral arrangements, a gesture made in honor of Libby’s grandmother to symbolize her presence at the wedding. 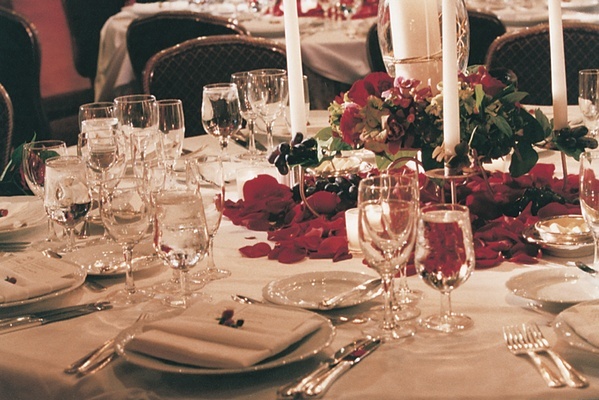 The delightful seated dinner consisted of a four-course meal that included salad, champagne sorbet, a choice of filet mignon or grilled chicken, and assorted desserts. The dinner was capped by a beautiful three-tiered wedding cake, with the center tier slanted on a diagonal. The top and bottom tiers were chocolate fudge cake with hazelnut and mocha mousse filling, and the middle layer was a white sponge cake with raspberries in white chocolate mousse filling. 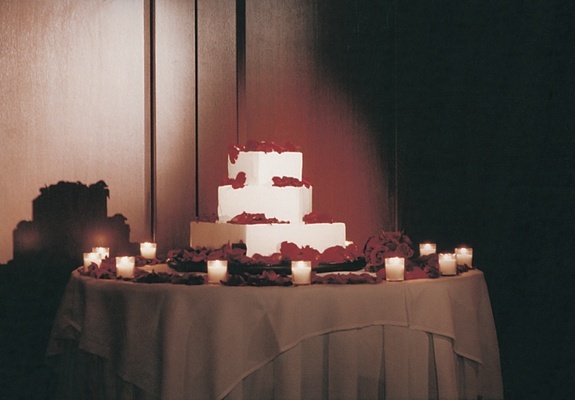 The cake was iced with white buttercream, sprinkled with red rose petals, and encircled by an additional burst of rose petals and many glowing votive candles. As mementos of the divine evening, Libby and Hunter presented their guests with chic wedding favors that consisted of cigars and personalized matchbooks. While their loved ones spent the following days reflecting on the beautiful wedding, the newlyweds continued the celebration by honeymooning on Vatulele Island in Fiji.